Fred Schuman, the 83-year-old Yankee fan better know as Freddy Sez, has long been an icon of Yankee Stadium. For as long as I can remember, Freddy has traipsed through Yankee Stadium with his handmade signs and worn pot and spoon, stirring up the crowd to cheer on the Yanks. Through the thick and thin, Freddy, the recent subject of a short documentary, has been there. So as I found myself next to Mike on Sunday in the Grandstand at New Yankee Stadium, I wondered aloud where Freddy was at the new stadium. The new home isn’t nearly as conducive to walking around as the old one. Freddy can simply walk up the steps to each section and walk back down. No longer can he walk around a concourse in the seating bowl because those concourses aren’t there. Around the fourth inning or so, I heard the familiar clang of Freddy’s pan and knew that all was right in Yankee fandom if Freddy was there. It appears, though, that Freddy has had to beg and cajole his way into the stadium. According to The Post’s Jeremy Olshan, Freddy hasn’t had an easy go of it getting into the stadium. The Yankees told Olshan that Freddy’s denial into the new stadium was a result of “miscommunication,” and the lifelong Yankee fan seemed to be back in the stadium by Sunday. I’ve never really grasped the relationship between the Yanks and Freddy. That he had a separate sponsor than the Yanks always struck me as odd, but hopefully, all’s well that ends well. Here’s to hoping Freddy’s back in the stadium for good. The online magazine No Mas recently profiled Freddy on video. You can check it out here, and I’ve embedded the video after the jump. It’s a first-person narrative video of Freddy making the trek up to the stadium. Good stuff. When I was a little kid, nothing would please me more at Yankee Stadium, other than a win from the Bombers, than a chance to bang on Freddy’s pan. In the days when 25,000 was considered a big crowd, Freddy with his “Freddy Sez” signs would roam the aisles of Yankee Stadium, and fans could hear that pan coming from sections away. 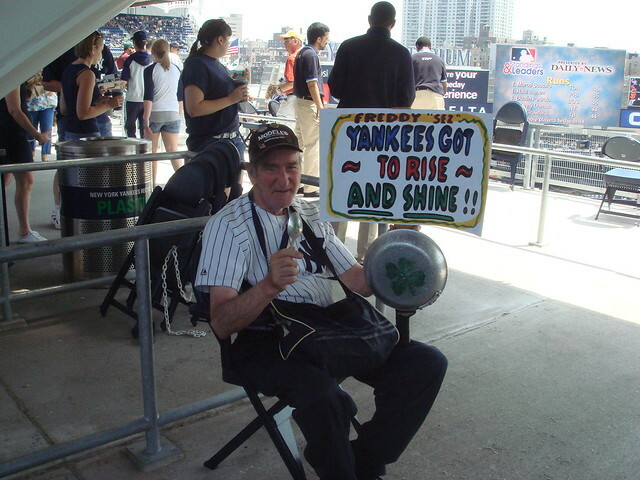 Over the years, Freddy has garnered his loyal following and has become something of an unofficial Yankee mascot to many. Two years ago, Manny Fernandez shed some light on Freddy with a profile in The Times. Freddy, we learned, has few teeth because he used to own a candy shop and has one eye after a stickball accident when he was nine years old in 1934. These days, Freddy’s clanging spoon isn’t as loud as it used to be. With capacity crowds at Yankee Stadium, the familiar sounds of Freddy fade into a generally raucous stadium. But as the 83-year-old makes the rounds, slower than he used to, that sound still fills the sections of the stadium. Now, I had always thought that Yankee fans were amused by Freddy. Here was an old man who loved the Yankees and showed it. But not everyone loves Freddy, I’ve learned over the last few weeks. While in 2005, Don Larsen clearly thought that Freddy was too loud, over the last few days, Freddy backlash has spread among a few Yankee fans. It started last week with an off-handed comment late in the game on PeteAbe’s site. Wrote the beat writer: “By the way, instead of a Hard Rock, the new Stadium needs to have a moat filled with giant snakes. That way they’ll have someplace to throw the guy who bangs on the pan. Is this New York or Arkansas?” That’s grumpy, no? So as the Yankees turn their eyes north to a new stadium rising at the corner of 161st St. and River Ave., their fans are growing wary of the frying-pan-banging old guy who simply loves the Yanks. Now, call me a sappy traditionalist, but I like Freddy. The cowbell guys at Shea Stadium and Tampa? Those are just rip-offs. Sure, he’s getting old; sure, his signs aren’t nearly as creative as they used to be. But I’d take the Yanks’ Freddy any day. There are things far more annoying at Yankee Stadium every day.